Xerox nails it - Accidental amalgams of isolated singletons - Only one contact away - Nonaka's knowledge spiral - We know more than we can tell - Oil that wheel! This week’s blog gets to the nub of a critical value-determinant in your business. 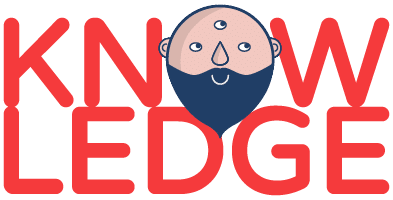 In this essay, the first in a sub-series, I am going to talk about knowledge management in a professional services business. I will seek to answer: what is meant by the term knowledge management (often abbreviated: KM), why it is so value-determinant, and, why any ambitious, high-growth business needs to embrace knowledge management as a core ethos and discipline? Of course, knowledge management sits at the foundation of the Method Grid platform – so this piece also provides context as to why such platforms as Method Grid facilitate value-creation. At the start of this blog series, I wrote about What makes a professional service firm successful (and, therefore, valuable). One of the cited critical factors was: The progressive development of, and investment into, your intellectual property. In a professional services context, developing intellectual property (often abbreviated: IP) is a closely correlate topic to that of knowledge management – so this essay also further elucidates on what this all practically entails. In short, the aim of this sub-series is to get beyond the sound bite and to arm you with suggestions and ideas you can apply to your entrepreneurial endeavour. Before we get going though, we need some definition. 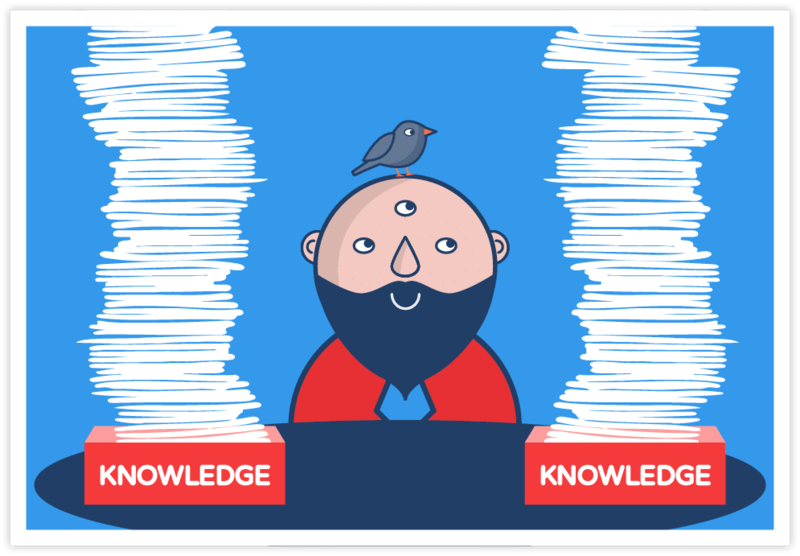 What is knowledge management and why so important? In the pursuit of new business value is the key clause in this definition. At a very practical level, as soon as you experience early growth in your professional services business (let’s say a team larger than five people), a genuine investment in knowledge management systems, tools and behaviours will start to impact on the value you create for your clients. Why is this? Well, as soon as you start to move beyond a very familiar, small team – you will invariably profit from all efforts that better connect your client’s problem (your delivery challenge) to all expertise, counsel and previously developed solutions that best address it – regardless of where this lives in your wider team! Not only does this avoid time-sapping wheel-reinvention, it also ensures your client receives a more considered response, faster. As a premier professional service firm, you claim to bring this value as a function of such intelligent collaboration. The converse is just to act as an accidental amalgam of isolated singletons (which is the shameful reality for many organizations). At a simple level, I would portray well-organized knowledge management in a professional services business as a situation in which if any consultant/advisor does not have an optimal answer/solution immediately to hand, then they are only one contact (chat/email) away from a ready-to-help colleague who does. This collaborative back-up to the actual consultant/advisor at the coalface is manifestly apparent to an end-client and, indeed, will be one of the key reasons why they pay premium rates for well-organized professional service firms (cf. the significant unknown delivery risk variable a client takes on when they hire a standalone individual). As I was powerfully reminded in a recent discussion with a Method Grid user (Paul Wilson, MD of Provelio) consultants are often prone to exaggerating the uniqueness of each client delivery situation. Paul’s business is involved in helping their clients navigate complex construction programmes (new hospitals, universities etc) so there are genuine reasons to suspect that all is professionally esoteric … “little can be repeated”. Paul, however, (correctly) dismisses this as nonsense … “ … it is the refuge of the mediocre”. Conversely, the best professional service firms obsess about systemising and capturing the common 80% such that the genuinely unique 20% gets the full focus of their delivery expertise. Knowledge management in this context is about investing in this repeatable knowledge capture – creating intellectual property that can be easily referenced and shared. Finally, in the vein of why is knowledge management so important in a professional services business? question, I would encourage you to examine this topic through the eyes of a new joiner to your business. If you are ambitious and seeking to scale then you will have many new joiners! Successful professional service firms oil this scaling challenge by heavily investing in this induction and onboarding discipline. Fundamentally, this is a matter of knowledge, skills (and confidence!) building. The best firms (i.e. those that successfully scale) commit to providing new joiners with the systems, tools and support networks they need – such that they can revenue-generate very shortly after joining. Knowledge management sits at the core of this endeavour. I want to move to an exploration of what knowledge management in a professional services business can actually look like. Indeed, I am going to share with you how I went about this when building a professional services business. Before I do so, I just want to digress into a little bit of theory before coming back to real world application. This will provide some important context as to what you are seeking to achieve. I want first to draw your attention to a model that made a lot of sense to me when I first came across it some twenty years ago: Nonaka’s knowledge spiral. Nonaka’s framework draws the distinction between two fundamental knowledge classes: tacit knowledge and explicit knowledge. Explicit knowledge is discrete and is captured in recorded artefact: files, documents, recordings etc. Tacit knowledge, by contrast, is deeply rooted in action, experience and our involvement in specific situations. As Michael Polanyi wrote (The Tacit Dimension; 1997): we know more than we can tell. Nonaka claimed that, at a fundamental level, knowledge is created by individuals, and, as such, organizational knowledge creation should be understood in terms of a process that amplifies knowledge already in existence. While each of these four modes of knowledge conversion can create new knowledge independently, a central theme of Nonaka’s model is the dynamic interaction i.e. organizational knowledge creation takes place when all four modes form a continual cycle. Nonaka’s model provides insights into how knowledge management in a professional services business can really excel. To start with, socialisation involves sharing experiences and mental models much in the manner of an apprentice observing an expert. This tacit to tacit knowledge flow can be enhanced via activities that bring practitioners together; for example by: pairing new joiners to shadow experienced practitioners, encouraging the exchange of delivery experience (story-telling and idea-trading), internal coaching and mentoring programmes, a facilitated community of practice (using online collaboration tools like Method Grid), regular social activities etc. 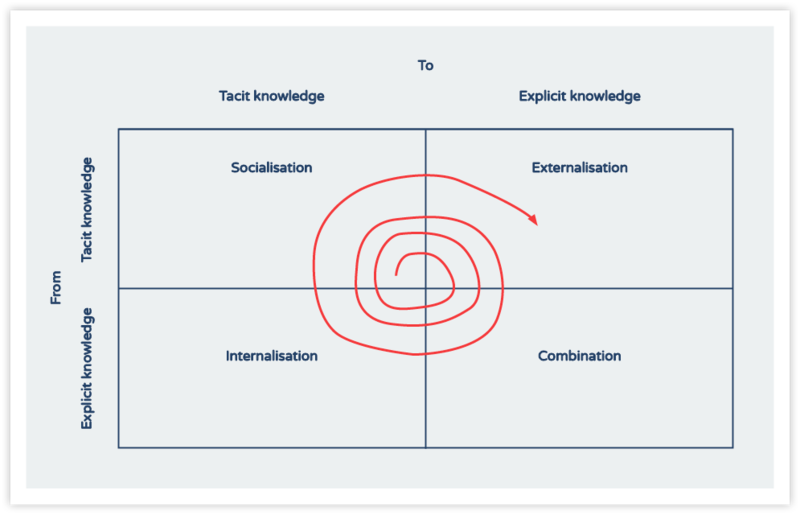 Secondly, externalisation involves converting such tacit knowledge into an explicit shareable form through the use of developed models and methodologies. This aspect is fundamental as most forms of professional service require the creation of tangible deliverables within a structured flow. Such centralised resources are paramount to avoid wheel-reinvention and to ensure consistent levels of service delivery excellence. Such a common, continuously-updated resource should point to exemplar reference points i.e. the best practice standards your firm aspires to. This aspect of knowledge management can be further enhanced by encouraging participation (HR strategy/reward) and the use of end-engagement reviews (to feed back into a central toolbox). Next, combination involves the intelligent filtering, bundling and structured packaging of a firm’s intellectual property. Service methodologies are inherently ever-evolving beasts and platforms such as Method Grid allow teams (possibly allocated KM leads) to quality-filter the latest best-practice artefacts into your firm’s knowledge base – following, say, the latest end-engagement review. Developed methodologies, by their very nature, then bring structure and shape to a firm’s knowledge. Finally, internalisation happens as a function of a practitioner using such a resource in anger in a specific client instance. Invariably, this will result in new ideas, new knowledge and new understanding – at an individual, tacit level. Simply put, when delivery experience is based on an explicit, captured way of working (cf. “winging it”) an individual is more easily able to make sense of the delivery experience and retain the often nuanced learns that come from this. Before even starting my own consulting company, Nonaka’s model helped me situate the challenge of how best to build-out knowledge management in a professional services business. Essentially, seen through this model, the challenge of a firm leader is to do everything possible to oil this wheel. Next week, I will continue this sub-series on knowledge management by translating this theory into practical advice: how to write a simple knowledge management strategy, practical KM initiatives and some ideas as to where you should be on this journey contingent on your team size.